Powers and protects devices during extended power outages. 5' cord allows placement on a desk or stand. 7 NEMA 5-15 outlets. 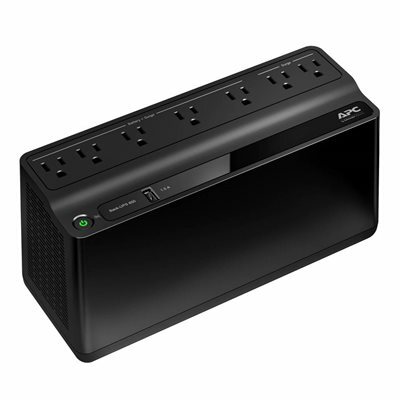 Includes 5 battery backup outlets and 2 surge-protection-only outlets. USB port allows you to charge mobile electronics. Helps protect connected devices against power surges. Light, compact design for easy placement and transport. Features keyhole sockets for convenient mounting. 15 amp, 600-volt and 330-watt capacity. Additionally, the BE600M1 UPS offers guaranteed surge and lightning protection for attached devices. By connecting your valuable devices, you are ensuring these investments against potentially irreversible damage. When the power goes out, the APC BE600M1 will power critical devices including home networking equipment; allowing you to maintain your internet connection. This allows you to work productively, avoid the loss of valuable data, and safely shut down equipment. This BE600M1 includes PowerChute Personal Edition software which provides UPS management options, safe system shutdown, and energy monitoring to enable cost savings and prevent potential data corruption. The BE600M1 also offers seven surge protected outlets, five of which provide UPS battery backup, and a 330 Watt/600 VA output power capacity. The BE600M1 is designed to maximize runtime for devices such as multiple PCs and AV equipment that consume high amounts of power. After these devices are safely shut down, the BE600M1 continues to run low power loads (such as home networking equipment) for up to 4 hours during extended outages. The Back-UPS BE600M1 is ENERGY STAR certified for its efficient operation and ability to help realize lower energy costs. The Back-UPS BE600M1 is covered by a three-year limited warranty. It also comes with a lifetime connected equipment protection policy of up to $75,000. APC will repair or replace attached devices that sustain surge-related damage while properly connected to a registered Back-UPS uninterruptible power supply unit.